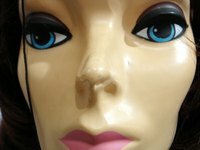 If you are looking for a mannequin to use for sewing clothing, you can add on a whimsical mannequin head that can be constructed out of craft materials. Adding on a mannequin head can turn your plain dressing mannequin into one that is comical and humorous. This can make your work more enjoyable, and can add an artistic element to your work space. You can customize the mannequin head using acrylic paints. Inflate a balloon to the size of a human head. Tie the end. Combine 2 cups of flour and 1 cup of water in a pot, and heat it until it boils. Reduce the heat and simmer the mixture for 5 minutes. Remove the mixture from the heat and allow it to cool completely. Cut newspaper into strips that measure 2-inches high and 6-inches long. Crumple up a small piece of newspaper and tape in onto the balloon where the nose should be. Crumple up another small piece of newspaper and tape it underneath the nose where the chin should be. Dip the newspaper strips into the flour mixture, and lay them over the entire balloon. Cover the balloon with four to five layers. Allow the balloon to dry completely. Pop the balloon with a straight pin. Remove the balloon, leaving the mannequin head behind. Paint the mannequin head with acrylic paint. Allow the paint to dry completely before placing it onto your dressing mannequin.